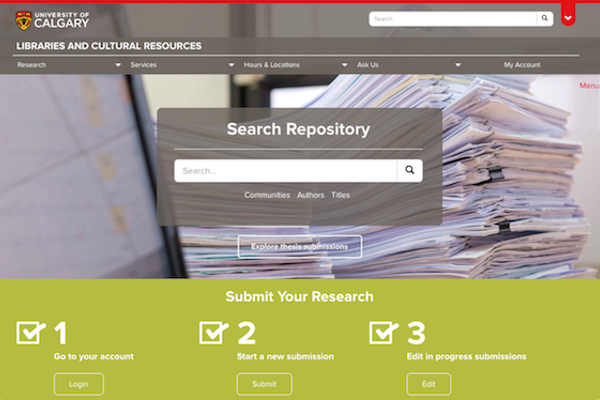 Members of the University of Calgary community can now archive, showcase, and track the impact of their research outputs with ease thanks to a major upgrade to PRISM, the University of Calgary’s Digital Repository. Established in 2003 and housing over 30,000 items, PRISM has long been a repository to share and preserve articles, theses, conference proceedings, technical papers, working papers, open educational resources, creative works, and more. In 2015, with the implementation of the Tri-Agency Policy on Open Access Publications, many grant recipients have taken advantage of this no-cost service to meet their open access policy compliance requirements. PRISM supports a wide variety of digital formats, allowing deposits not only of research but of related materials (including images, audio and video files, etc.) that give context to research and promote further scholarship. Since 2012, the Faculty of Graduate Studies has collaborated with Libraries and Cultural Resources (LCR) to archive and share electronic theses and dissertations through The Vault, a separate digital repository. This upgrade integrates theses into the larger digital repository, making it easier for students to deposit and share their work, and for readers to discover and request both current and legacy theses. The Repository Upgrade Project was funded by the provost’s office and supported by the university’s Information Technologies and LCR. PRISM continues to be built in DSpace, a widely used, open-source software platform. Atmire, an international specialist in DSpace repositories, was contracted for the technical development.